If you've driven by water, chances are you've seen them. Calm, relaxed-looking men and women standing on what look like surfboards with a single long paddle in their hands, and by all outward appearances, living the good life. 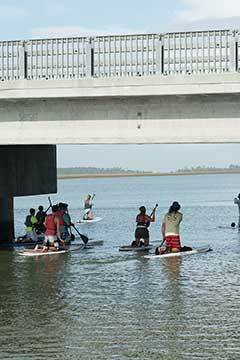 The activity is called paddle boarding, and advocates claim it's the fastest-growing watersport in the world. 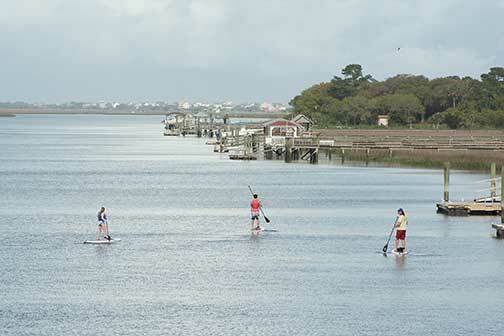 "Without a doubt, paddle boarding's popularity has skyrocketed around the world in the past few years," says Stu Schuck of Isle of Palms-based Ocean Fitness, a company specializing in paddle boarding lessons and tours. 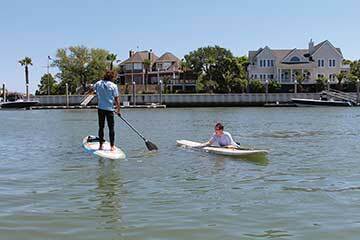 Paddle boarding combines the athleticism of surfing and the peacefulness of kayaking. 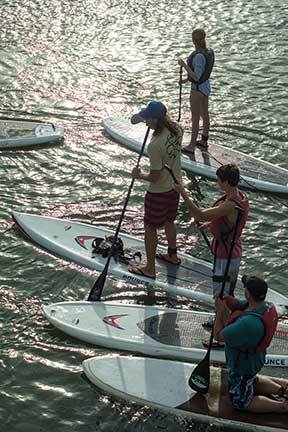 While there are competitive races for those so inclined, the vast majority of paddle boarders do it for the relaxation, recreation and the healthy workout it provides one's upper body and core. It's a chance to commune with nature in a personal way without disturbing the environment or the water with the noise and trouble of a gasoline engine. Peaceful, right? For novices, though, getting to that peacefulness can be a challenge as one focuses on the first, most-pressing challenge - getting to a standing position without getting wet. I'm just going to spoil things right here and now by saying this author did not stay dry, but I'll get to that in a moment. I met Schuck for a lesson and a paddle at the Isle of Palms Marina on a gorgeous April Saturday with almost no wind and temperatures in the low 80s - perfect weather for paddle boarding, as we had no chop to deal with, though there was plenty of wake from other watercraft to go around and make one nervous. Before getting near the water, Schuck gave me a five-minute lesson about the mechanics of holding the oar, how to perform a stroke correctly with maximum arm extension and how to execute turns. For anyone who has rowed anything, the mechanics are simple and intuitive. However, standing up on a paddle board, keeping one's balance while in jeopardy and moving forward in a fashion that does not endanger oneself or others, is not. I should note here that Shuck is an expert paddle boarder with decades of experience on the water as a surfer and competitive kite boarder so naturally gifted it looks like he could fall asleep standing up on a board. And, as I struggled to maneuver around the marina, I'm not so sure he didn't. I mentioned the weather. Sadly, he and I were not the only ones to take notice of it. On such a beautiful day, everyone with a boat of any kind at the Isle of Palms Marina was hustling to get on the water. Boats of every size and type were everywhere, offering plenty of wake with which to tempt the nervous paddle boarder into the lagoon. But before one can fall, one has to get to a standing position. Having been well instructed and having practiced the small jump from one's knees to an upright position several times on shore, this was far less of a problem than I'd anticipated. I'm certain I probably even congratulated myself in the moment on how easy I (thought I) made it appear to onlookers. But as pride cometh before a fall, so did my cockiness precedeth a bath. Getting a few nervous strokes under my belt, just enough to move myself from the safety of the dock out into the middle of the marina, I studied how Stu was standing on his board - relaxed, knees slightly bent, feet fairly close together. I noticed I was standing with my feet as wide apart as the board would allow in order to coax the most balance possible from the rather slender bit of fiberglass that stood between me and the ocean and that suddenly seemed much thinner than it did on shore. Eager to look like I knew what I was doing, I scooched my feet closer together and adopted a relaxed look while casually paddling out to Stu. That was a mistake, as I learned while falling face-first into the water after losing my balance on what was really a kiddie-wake, though which seemed to me at the time to be a ten-foot swell. There's nothing like getting wet to overcome the fear of getting wet, and from there out I wasn't as worried about the possibility of falling. Stu's patience with me and encouragement also helped. After about ten to fifteen minutes of paddling, as we headed out of the marina into the narrow tidal waterways where the sea air and unmistakable aroma of pluff mud filled my senses with calm and satisfaction, it began to come naturally. That's also about when I ran into the first and only sincere danger of the experience, and it had nothing to do with the activity of paddle boarding. Stu had warned me about avoiding the oyster-encrusted bridge posts as we paddled out. Since boards are expensive ($600 and up for a new one), you don't want to damage them by scraping them on a cluster of oysters, much less yourself should you fall against them. So, I was again quite proud of myself for maintaining a course perfectly equidistant from the posts as we went under the one short bridge between the marina and the ocean. That was when a flash of silver caught my eye. I noticed Stu, who was ahead of me by about ten feet, bend slightly to avoid something swinging in front of him. Then as my eyes focused on the object swinging wide in an arc to my left, I could see what was about a three-inch lure with six large hooks that had been cast from a fisherman above us who had no way of seeing us emerging from the bridge below. For a split second I watched the lure arcing back toward me, almost admiring it, until the tiny part of my brain that didn't check out during my tenth-grade geometry class did the appropriate calculations and immediately sounded the alarm that a collision was both imminent and unavoidable. Instinctively - it's amazing what one's body can accomplish when there's not time to think about it - I took my paddle out of the water and in one graceful swoop swatted the enormous collection of hooks away from my face just inches before it could find purchase, then put the paddle back in the water and with a couple of powerful strokes pushed myself out of danger. The rest of our half-hour voyage around the inlets and back into the marina was extremely pleasant. We chatted and talked about the sport - there are even popular yoga classes held on paddle boards, Stu informed me - as my confidence and skill gradually grew. If you're remotely athletic, paddle boarding isn't difficult to get the hang of. But I will caution that you should know what you're getting into. It isn't a relaxing activity, at least not for the beginner, as the simple act of paddling is significantly more strenuous standing up than it is sitting down. If pure relaxation is what you're after, I recommend a kayak or canoe. But if you want a challenge and a workout to go with your serenity, by all means, give it a shot. If nothing else, the sense of satisfaction from being able to master the basics alone is worth the effort. If you're looking to buy a new board, plan on spending anywhere from $600 to $1,000 depending on quality and length. Sizes range from twelve to eighteen feet, and like snow skis, longer boards mean more speed, shorter ones mean more control. A brief survey on Craigslist showed used boards running anywhere from $450 to $750, so there is value to be had. 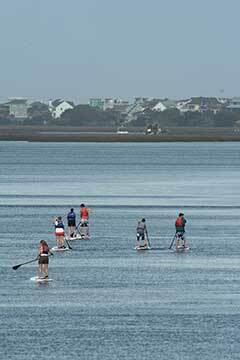 If you're in Charleston, Stu will gladly arrange a quick lesson and guided tour for about $60 or just rent you a paddle board for $32.50 for two hours of fun. To learn more, visit his website, http://beoceanfit.com. 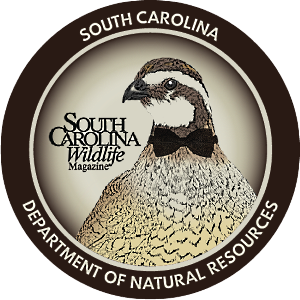 Ron Aiken is a Columbia-based freelance writer.